If summer 1967 was the Summer of Love, then summer 2010 is shaping up to be the Summer of Blood. With the June 13 premiere of its third season, "True Blood" has cemented its place as HBO's must-see successor to "The Sopranos." On Sunday, ABC rolled out "The Gates." Think of it as "Desperate Housewives" meets "Dracula," set in a private gated community where everyone has a dark secret. And you can already hear teenage girls and their moms squealing with anticipation as Edward, Bella and Jacob get set to return Wednesday in "Eclipse," the third installment in the inexplicable yet unstoppable "Twilight Saga." Wherever you turn, you can't help but run into vampires, werewolves and, sometimes, even a witch or two. Never ones to be left out, zombies are on the prowl, too. AMC has already geared up its publicity campaign for its new series, "The Walking Dead," which debuts in October. Filmed in Atlanta and based on the acclaimed Image Comics series written by Robert Kirkman, "The Walking Dead" follows the survivors of a zombie outbreak as they try to avoid becoming dinner for the undead. Vampires, werewolves and zombies — between them, monsters are having a major resurgence, not unlike the blossoming of horror movies during the Great Depression, when Universal Studios unleashed Dracula, Frankenstein, the Mummy and the Wolf Man on unsuspecting theatergoers. According to the conventional wisdom, there is something about hard times that makes people turn to the macabre. But the "conventional wisdom" is seldom right, and "macabre" doesn't really describe this new batch of "monsters." Werewolves are no longer tortured souls condemned to turn into ravenous beasts during every full moon, posing an unwitting danger to those they love. Instead, they can transform from human into wolf at will, while still retaining their human intelligence. Meanwhile, not all vampires are destined to lurk forever in the darkness. Some can venture out into the daylight and lead largely normal lives, apart from slipping off for an occasional bite. They run multinational corporations, have spacious homes in the suburbs and jet around the world to meet with the head vampire, or whatever. Some of them even sparkle in the sun, but the less said about that, the better. Zombies are a bit harder to tame, but you can at least make fun of them. Except for "The Walking Dead," which plays the zombie genre straight, most recent zombie stories have played zombies for laughs. Whether it's "Zombieland" or "Shaun of the Dead" or "Pride and Prejudice and Zombies," it's getting really difficult to take those shambling, brain-craving corpses seriously. Sure, vampires and werewolves still come down with a case of bloodlust from time to time, especially when they are fighting each other during one of their interspecies turf wars (see: "Twilight" and "Underworld"). But for the most part, they have gone from being bloodthirsty monsters to romantic heroes, or at least anti-heroes. And they fall for the dullest women. Seriously, are there two more boring fictional characters than Bella Swan and Sookie Stackhouse? I haven't read the books, but if the movies and the TV series are any indication, they're the least interesting characters in their own stories. So, what does it mean that vampires and werewolves are now romantic leads? For one thing, I suppose it means people don't mind May-December romances anymore, even if December is in an entirely different century. Also, excess body hair is apparently no longer a deal breaker, which is good news not only for werewolves but for Robin Williams, too. Or, maybe it means that the suave romantic vampire represents bloodsucking capitalists who sell themselves to the masses via slick marketing, while the werewolf represents the oppressed working class trying to strike back at its centuries-old oppressors, only to lose its shirt and the girl in the process. Or not. I'm pretty sure you have to be a Marxist college professor to buy all of that, but you never know. George Romero's zombie movie "Dawn of the Dead" is supposedly an allegory for mindless consumerism. But what I learned from it was that the mall has everything I need to fight zombies. The saying in Hollywood is no one sets out to make a bad movie. But sometimes, that's exactly what happens. Take "Atlas Shrugged," the long-awaited film adaptation of Ayn Rand's best-selling, 1,300-page novel, first published in 1957. Rand's fans have waited 50 years for the book's leap to the big screen, and plans for a movie version have circulated for three decades. Now the movie is finally happening, but it's likely to leave even Rand's most ardent admirers shrugging. The adaptation that started production this week is like nothing anyone had expected, or wanted. Instead of a star-studded epic befitting a novel of "Atlas Shrugged's" size and scope, this "Atlas" looks like it'll be something you might one day stumble upon on Lifetime Movie Network, late at night, when no one else is watching. Paul Johansson, best known for his role in The CW's "One Tree Hill," is both directing and playing the pivotal role of John Galt, who leads a "strike of the mind" against the twin forces of big government and the unproductive businessmen who run to the government in search of bailouts and subsidies. You could say the story is topical. I don't know about you, but when I think of Rand's personification of the heroic ideal, I don't think of "One Tree Hill's" Dan Scott. Actually, I never think of "One Tree Hill," period. Starring opposite Johansson is Taylor Schilling as Dagny Taggart, around whom most of "Atlas" revolves. Schilling's resume is thin. She is fresh from playing the lead on NBC's critically panned — and canceled — medical drama "Mercy." But according to the Internet Movie Database, her only previous role was in the 2007 film "Dark Matter." Helping round out the cast of virtual unknowns is Grant Bowler ("Ugly Betty") as steel magnate Hank Rearden. Not to slight any of these actors, but we are talking about a project that has, over the years, drawn interest from A-list talent like Angelina Jolie, Brad Pitt and, most recently, Charlize Theron. Proposals to adapt "Atlas Shrugged" for the screen have ranged from film adaptations, sometimes breaking the novel into multiple movies, to a TV miniseries. Suggested budgets have gone as high as $40 million, no doubt with the hope that top talent would take pay cuts in exchange for coveted roles. Instead, we're getting a rush job with a no-name cast, a budget of just $5 million and the promise — or is it a threat? — that at least one more movie will pick up the story where "Atlas Shrugged Part One" leaves off. John Aglialoro, CEO of exercise equipment manufacturer Cybex International, paid $1 million for the movie rights to "Atlas" in 1992. Yet, despite years of false hopes and false starts, he failed to get the movie going, and his time was running out. If "Atlas" had not gone into production this week, Aglialoro's option would have run out. So, Aglialoro is pressing on with what he has, which isn't much. That's why his "Atlas Shrugged" looks like more of a scheme to hold onto the film rights than a proper movie. This wouldn't be the first time someone has rushed a low-budget movie into production just to retain the right to make a better version later on. In the early 1990s, a German company held the rights to make a movie based on Marvel Comics' The Fantastic Four. With their option running out, the German producers brought in American B-movie king Roger Corman to make a quickie FF movie so they could keep their option alive. With a reported budget of $1.4 million — would that even cover the catering on most films? — and featuring a no-star cast, Corman's "The Fantastic Four" became the stuff of legend. It was never commercially released, and it exists today only as bootleg DVDs you can sometimes find at comic book conventions. It's the "Star Wars Holiday Special" of superhero movies. Eventually, 20th Century Fox would release two big-budget Fantastic Four movies. But they aren't particularly good, either, come to think of it. 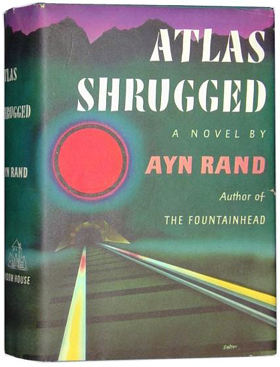 Will this B-grade "Atlas Shrugged" movie ever see daylight, or is it destined to follow Corman's FF into obscurity? Who knows? The next time you're in a movie theater, look at the posters hanging in the lobby. You'll notice they have one thing in common. Once upon a time, movie posters were little works of art, prized by film buffs and collectors. Now, they're a testament to the evils of Photoshop. 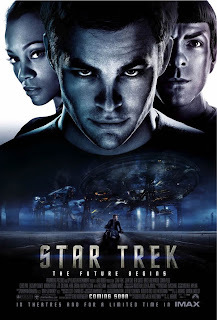 According to my unscientific survey, half of all new movie posters simply depict the heads of actors Photoshopped in orbit around the movie's logo. These posters are creatively bankrupt and fail at what should be their one and only job: generating excitement for a movie. A recent offender is a poster for "Iron Man 2" that shows the cast's publicity photos floating above an explosion. It's every movie poster sin collected in one place, as if to serve as a case study of what not to do. Obviously, the studio wasn't counting on that poster to sell tickets, since "Iron Man 2" already had a built-in audience. But that excuse doesn't keep a boring, unimaginative poster from being a boring, unimaginative poster. Horror posters are even worse. Every installment of the "Saw" franchise comes with a now obligatory poster depicting an amputated body part. That gimmick wasn't particularly clever the first time, never mind the fifth. The only suspense is, what body part will it be next time? So far, we've had a foot, a couple of fingers, a head and some teeth. Before Photoshop made things too easy for lazy movie marketers, movie posters had style. Often they were the work of talented artists and painters. Most famously, Clint Eastwood recruited Frank Frazetta to paint the poster for "The Gauntlet," Eastwood's 1977 police thriller. In good condition, original prints of Frazetta's poster now go for hundreds of dollars on eBay. The iconic 1977 "Star Wars" poster, featuring Luke with his lightsaber raised above his head and Princess Leia showing more leg than she actually would until "Return of the Jedi," is another classic example of a movie poster that draws you in. They don't make them like that anymore. Old-school posters did have their clichés, but at least they were memorable clichés. The beautiful woman in the arms of a monster, alien or robot was a favorite. It popped up everywhere from "Creature from the Black Lagoon" to "Forbidden Planet." And to be fair, floating heads predate the Photoshop age. But when one of your floating heads is Boris Karloff as Frankenstein's monster, you've already succeeded in generating audience interest. The best old-style posters were often for low-budget movies destined for rural drive-ins and urban grindhouses. The artwork was usually lurid and accompanied by over-the-top proclamations like, "What he does to your nerves is almost as frightening as what he does to his victims!" from "The Toolbox Murders." But an effective poster could also be simple, such as the giant shark coming up from beneath the swimmer on the "Jaws" poster. If someone were to make a poster for "Jaws" today, it would probably show the heads of Roy Scheider, Robert Shaw and Richard Dreyfuss floating above an exploding boat, with a shark hidden somewhere in the background. Maybe movie studios think they don't need movie posters to promote movies anymore because they have the Internet. But if "Snakes on a Plane" proved anything, it's that Internet hype doesn't always translate into box-office success. And "Snakes on a Plane" had a lousy poster.